Home to some 14 million people, the exciting city of Delhi in India will, for the first time, play host to the Commonwealth Games. It is only the second time the event has been held in Asia. 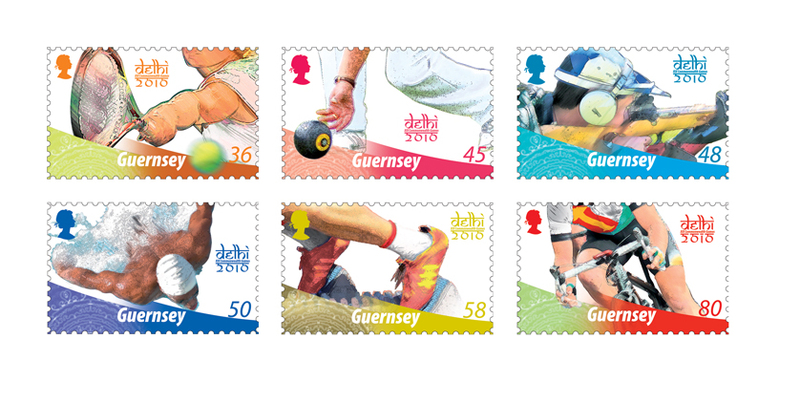 To celebrate the 40th anniversary of Guernsey’s participation at the Games, our stamps - depicting images of Athletics, Cycling, Shooting, Aquatics, Lawn Bowls and Tennis - are designed to convey the passion, professionalism and sheer determination of Guernsey’s talented athletes. Guernsey can be justifiably proud of its long heritage of sporting success, with many of its athletes winning medals and becoming record holders, competing not only in the Commonwealth Games but also in World, Olympic, British and European Championships. It should come as no surprise that there are over 70 different governing bodies for sport and leisure activities in Guernsey; nearly 19,000 islanders take part in sports-related activities. The recently established Sports Commission also promotes athletic excellence by providing grants which enable sportspeople to participate in events like the Commonwealth Games. Guernsey is also making strides with its Youth Development programme and boasts many talented younger athletes who hold Junior British national titles. Two young female athletes travelled to the 2nd Commonwealth Youth Games which was held in Australia in 2004 and the youth team came home from the 2008 Games with a Gold medal. With special thanks to the Guernsey Commonwealth Games Association.